9:1 Then he got into a ship and traveled over to his own village. 9:4 Knowing their thoughts, Jesus replied, “Why do you entertain wicked thoughts in your hearts? 9:7 Then he got up and went home. 9:8 When the crowds saw this they were amazed, and praised God – who had given such authority to someone. 9:9 As Jesus traveled on from there, he saw a man named Matthew sitting at the tax collector stall and he said to him, “Follow me.” And he got up and followed him. 9:10 Later on, Jesus and some of his disciples sat down and dined together with many publicans and sinners. 9:12 But when Jesus heard this, he told them, “Those who are healthy do not need a doctor – only those who are sick. 9:15 Jesus asked them, “Do the servants in the bridal chamber mourn when the bridegroom is with them? A time will come when the bridegroom will be taken from them and then they will fast. 9:16 No one puts a patch of unshrunk cloth onto an old garment, for such a patch will come apart from the garment – causing a worse tear. 9:19 Thus Jesus got up and followed him along with his disciples. 9:20 Suddenly a woman who was ill with a blood disorder for twelve years came behind him and touched the hem of his cloak. 9:22 But Jesus turned around and when he saw her, he said, “Child, have courage, your faith has made you whole.” The woman was healed at that moment. 9:24 he said to them, “Make room, for the girl is not dead, but sleeps.” They laughed and ridiculed him. 9:25 But when the people left, he went in and took her by the hand, and the girl woke up. 9:26 The news of this spread throughout the region. 9:31 But when they left, they spread the news about him throughout the region. 9:32 After they left, they brought back to him a deaf and mute man possessed by a demon. 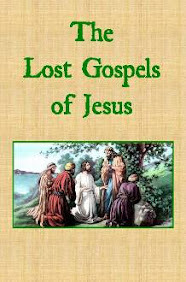 9:35 Then Jesus traveled throughout the towns and villages, teaching in their synagogues and preaching the gospel of the sanctuary. and healing all kinds of sickness and disease among the people. 9:36 As he saw the crowds, he was moved with compassion for them – because they were troubled and confused like sheep without a shepherd.